Our most famous poet, and maybe deservedly so. 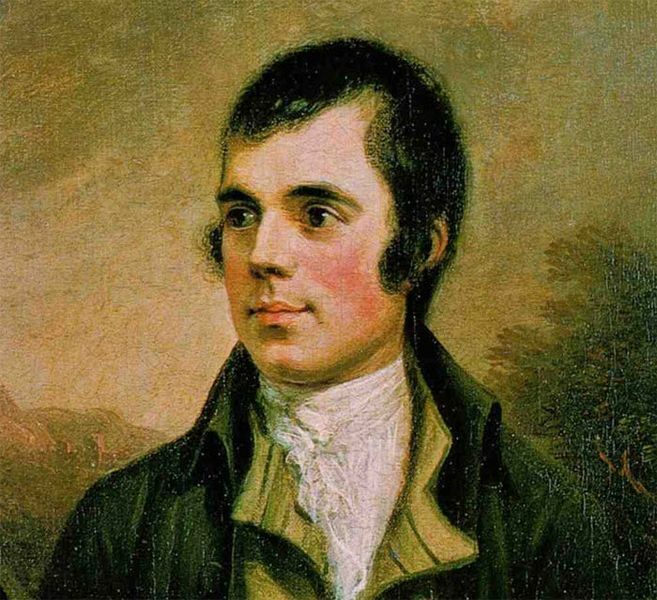 It’s his birthday today, so it’s Burns Night celebrations tonight. Everyone has their own perspective on Burns, but I won’t waffle on wi mine, instead deferring to some of our poets. I think it does a service to Burns to offer poems that show him in a critical — if affectionate — light, because he was a relentless critic himself, taxman and ladies man though he was. Here’s one of Edwin Morgan’s — he was our last Makar, or national poet — from his cycle The Five-Pointed Star, which are five monologues from different historical figures about Burns. James Macfarlan was a 19th Century working class Scots poet. “A man’s a man for a’ that” – how does he know? That’s feeble – to show the new age its dark face? To the very gods from which he ought to resile! “Liberty’s a glorious feast,” you said. Is that right? Wouldn’t the poor rather have bread? Burns man, I’m hard on you, I’m sorry for it. I think such poetry is dangerous, that’s all. Of bonhomie will not let the future grow. Aboot Man-Mouse Amity? Ye’ll rhyme a ream! – Saut tears, sigh, sympathy – he’s sensitive. Ploughman? That will be right! Heaven-taught? He drank deep o The Bard, and Gray, and Pope – the lot. For Man’s Dominion he was truly sorry? Not! ‘T was all an act. Burns, baith man and poet, liked to dominate. His reputation wi the lassies wasna great. Your Twentyfirst Century Global Distress Age. That I wad spier the leave o’t. An’ let me steal the favour. Was worth a royal ransom. But what wad do yon. Lastly, here’s WN Herbert on a bit of contemporary Scots lit, that that owes its affiliation to our other most famous poet . . .
welcome to thi Cabaret Guillaume McGonagall. thi dregs o Scoatland gaither at Chez McGonagall. come in disguise jist tae despise thi haill damn Cabaret. thon ambient soond’s him layin a log. treh thi Bistro de McGonagall. welcome to thi Hotel Guillame McGonagall. ut’s open mike fur any shite doon at thi Cabaret. Thi booncirs think we ought tae leave thi Club McGonagall. Eh wish that Eh has ne’er set eye upon this Cabaret.